#7625 Certificate of Participation With green border. An ideal commercial tool for contest directors. #7633 Award Certificate for Baton Contest With gold border. Can be used instead of medals at contests - and for local events. #7641 Certificate of Advancement With light blue background and dark blue border. Gold foil around logo. To recognize graduation to advanced division in all categories of competition. #7658 Certificate of Advancement from Novice to Beginner With green border. #7666 Certificate of Advancement from Beginner to Intermediate With gold border. 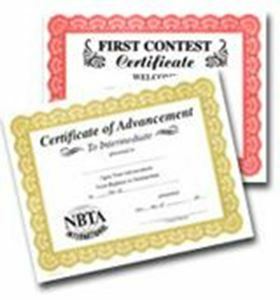 #7674 First Contest Certificate With red border. #7682 Member of the Twirling Team With brown border. #7690 Member of the Corps With brown border. #7708 Special Salute For All Occasions With gold border. #1792 Certificate of Merit With brown border. #7716 Certificate of Attendance With brown border. #7724 Certificate of Recognition With brown border. #7732 Certificate of Appreciation With brown border. Each of the colorful certificates is designed with a specific purpose in mind. Each is distinctive with a different color border. $.15 each. With green border. An ideal commercial tool for contest directors. With gold border. Can be used instead of medals at contests - and for local events. With light blue background and dark blue border. Gold foil around logo. To recognize graduation to advanced division in all categories of competition. Note: You'll need to write over the "19__" with the current year. That is why we can reduce the price to only $.15 each.